Ages 5 through 14. 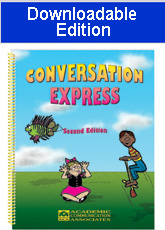 Expand oral communication skills as children create conversations and short stories for the appealing illustrations in this easy-to-use book. Each of the stories shows characters involved in a variety of activities. The conversation bubbles are missing text. Students are challenged to fill in the missing text. The pictures show a variety of humorous interactions and are great for stimulating both oral and written language expression. Present each picture to the student and read the story starter. Ask the student to finish the story and to create text for the conversational bubbles. Read stories completed by students to the class as a whole. Provide opportunities for groups of students to act out their stories. The story pictures may be reproduced.